An American eel rests on the edge of the rock, covered in muck. I carefully climb down the rocks to the pool where it is resting, trying to remember if eels bite. I’m fairly certain they don’t, but I’m pretty sure they are slippery. What I know is that this eel needs my help getting out of the construction zone that is being actively dewatered so this dam can come down. Riverkeeper Kate McPherson works to free an eel stuck in the mud. I rest one hand on what is left of the old spillway of the Shady Lea dam and reach for the eel, right behind the gills. I am not quick enough, and it swims under a large boulder, into deeper liquid muck. On my hands and knees reaching under the rock, with dark water swirling up my arm past my elbow as I feel around for the eel, I beam up at Ashlee Tyce and tell her without any irony at all that I love my job. The habitat behind Shady Lea mill is a secluded stretch of wide shallow river, with white oak and red maple trees shading the water on the southern bank and highbush blueberry, sweet pepperbush, and green briars tucked between the trunks. Cinnamon ferns nod at the riverbank edge and an occasional skunk cabbage crops up along the wooded bank. That warm spring afternoon was a chorus of birdsong. As we discussed backhoe access to the river, a blue-gray gnatcatcher flitted from branch to branch looking for small arthropods, a great crested flycatcher flamboyantly announced its presence from a nearby low branch, and warbling vireos sang at the pond edge. Deeper in the forest to the south, ovenbird, eastern towhee and black and white warbler sang. A pine warbler stopped to consider if the deciduous canopy would meet his nesting requirements as we considered the logistics of taking down this historic, but high-hazard, dam. 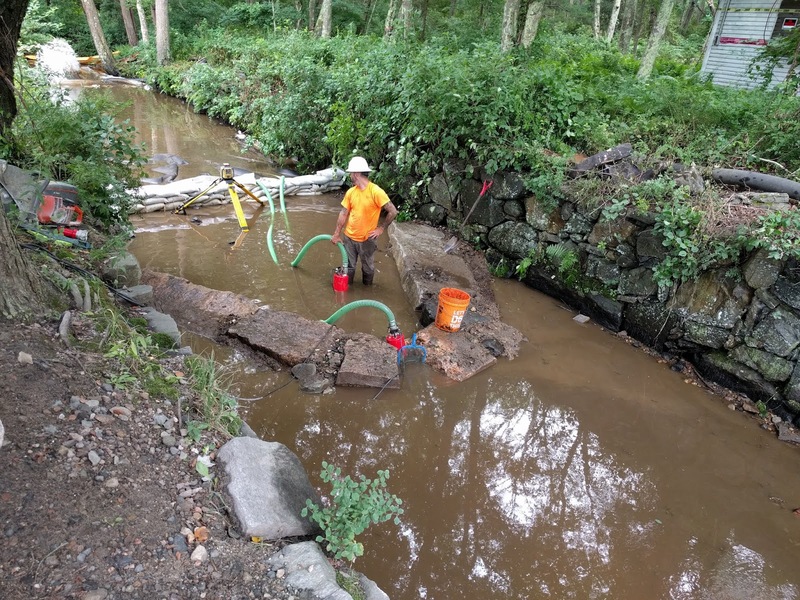 Workers test the new stone weirs in the Mattatuxet River behind Shady Lea Mill in North Kingstown. I suppose that warbler must have found a nice patch of white pines this summer, since it’s now mid-July and I haven’t heard him sing since. The dam is now halfway out at Shady Lea, and will be replaced by four granite rock weirs over which the river will cascade down and fish will swim up. For the first time in 200 years, wildlife, including species that are not terribly mobile, will be free to move up and downstream. This will mean changes to the wetland habitat upstream of the old dam, but change is constant in a river system, and already the Mattatuxet River is adapting. Seeds trapped in what was the mucky pond bottom have a chance at life and new plants have emerged. Deep areas previously hidden by the pond have been revealed and may provide new breeding habitat for wood frogs and spotted salamanders. After my eel adventure, I walk upriver to what’s left of the old impoundment, where the water collected above the dam.The painted turtles and green frogs I’ve seen here won’t mind the changes to the river, for they are equally at home in permanent ponds and small rivers. I hike through some fragrant sweet pepperbush at the wetland edge, and the gray catbirds, irritated, glare and scold. I startle a musk turtle on the move! A rare treat, musk turtles are shy aquatic species that prefer slow moving muddy bottomed waters. This turtle is moving north into the deep marsh upstream. The new, free flowing Mattatuxet River. 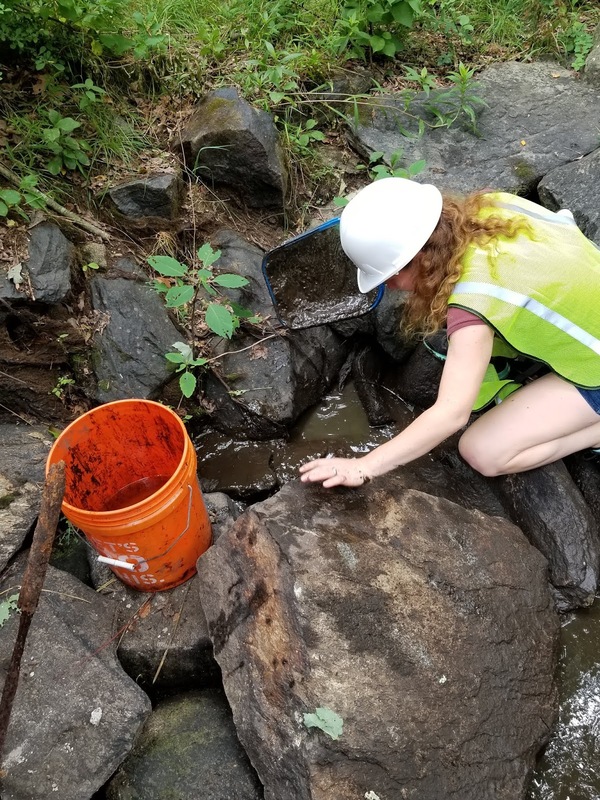 Now that the dam is on its way out, this turtle’s offspring will be able to find their own habitat downriver to slow-moving muddy habitat in Carr’s pond. 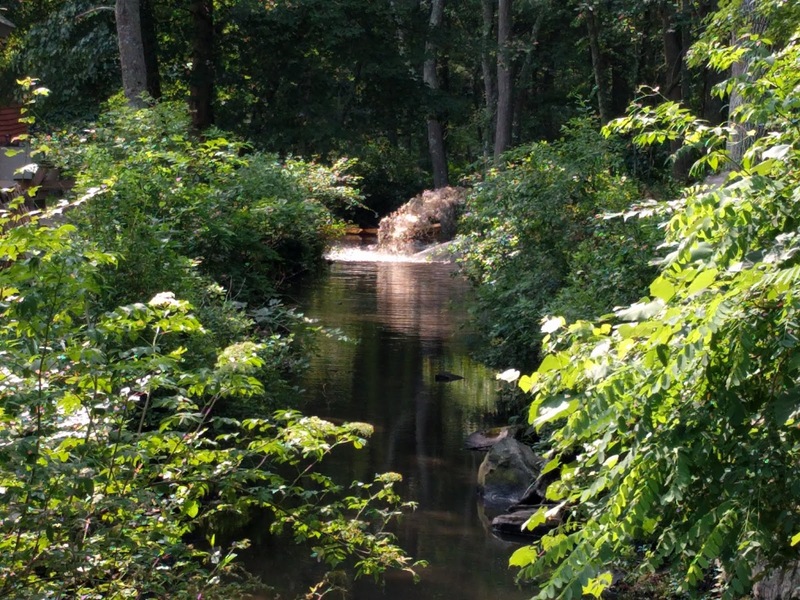 Opening up the river will hopefully mean anadromous fish—fish such as alewife and blueback herring, which spawn in freshwater rivers and return to the ocean—will be able to bring a new generation of fish in the waters behind Shady Lea mill. Observing the changes, I can’t help but feel optimistic.